Your Teeth Are Hungry. Feed Them. Making sure your body has all of the vitamins and minerals that it needs is not always the easiest thing to accomplish. Even though most people know that a balanced diet is important for personal health, taking the time to actually develop proper eating habits and hitting as many food groups as possible in a day is not always a priority. Here at Salvatore Dental, we want all of our readers to understand that by not taking the time to ensure that your body has the proper nutrition, you aren’t just doing a disservice to your muscles, joints, and organs, you are also doing a disservice to your teeth and gums. In today’s post, we are going to continue where we left off last time and go over some of the vitamins and minerals that are essential for a healthy mouth. After you have read our previous post, continue reading below to learn more. Vitamin A: Whether you want to think about it or not, your mouth is made up of a bunch of mucous membranes. These membranes are essential to many functions and Vitamin A is responsible for keeping these mucous membranes healthy. This vitamin makes sure that you do not suffer from dry mouth, a condition that can lead to excess bacteria formation and plaque development, while also helping to make sure that your mouth is able to properly heal after injuries. Vitamin C: Vitamin C is not that important to your teeth, however, it is super important to the health of your gums. Anyone who has watched a pirate movie has probably heard mention of a disease called scurvy. Essentially, scurvy is a disease that results from a Vitamin C deficiency, a common deficiency amongst early sailors, and leads to bleeding from the gums and other soft tissue of the face. By making sure you intake enough Vitamin C, you are helping to ensure that your teeth have a solid foundation holding them in place. Phosphorus: On its own, phosphorous doesn’t do all that much in relation to the health of a person’s teeth. Fortunately, when you include phosphorous in a diet, it works with any calcium present in the system to help increase the strength of bones, including teeth. If you’re worried about finding a source of phosphorous, don’t. Seafood, soybeans, beef, pork, cheese, and lentils are all excellent sources of phosphorous. 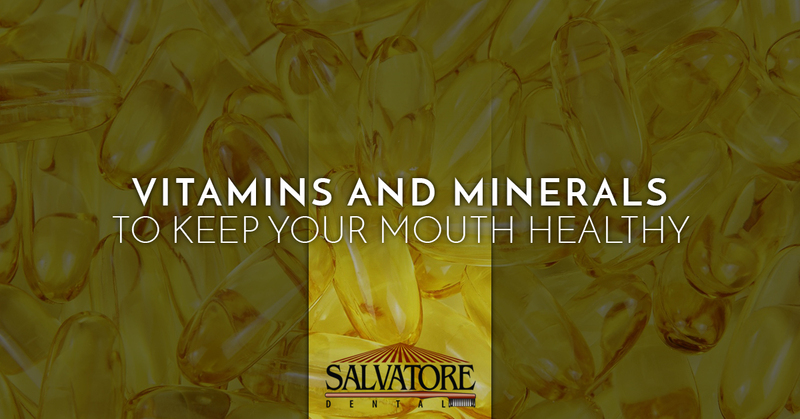 Thank you for reading our short blog series on the vitamins and minerals that are essential to overall oral health. Even though it takes more than a few nutrients to ensure that your teeth and gums are as healthy as possible, making sure that your diet includes these essential substances is a good line of defense against tooth decay and gum disease. If after reading this blog you realize that you are in need of dental services, please do not hesitate to get in touch with us at Salvatore Dental. We have been helping Saratoga residents with their oral health needs for years and we are certain that we can handle any issue that you may be having.